When America's best figure skaters come to Spokane this January to compete for spots on the U.S. winter Olympic squad, they will meet a team of Whitworth University athletic-training students and faculty ready to help provide them with nearly around-the-clock medical care throughout the competition. During the 2010 U.S. Figure Skating Championships, to be held Jan. 14-24, fourteen students will work with teams of doctors, athletic trainers and physical therapists from Group Health Cooperative, the event's official medical sponsor. The students will work under the direction of Ed Reisman, M.D., a family practice physician and former competitive skater who will serve as medical director for the championships. Reisman also is Whitworth's team physician and works closely with students in the university's nationally accredited athletic-training program that emphasizes hands-on clinical experience. This is the second time Whitworth students will have worked at the figure skating championships. Whitworth also collaborated with Group Health to provide medical care when the championships were held in Spokane in 2007. "Dr. Reisman knows the rigorous coursework our students receive, he has seen the quality care they provide our student-athletes, and he recognized that they were a valuable part of the medical team during the 2007 skating championships, says Russ Richardson, associate professor and director of athletic training at Whitworth. "Working at the competition provides a unique learning opportunity for our students, both because of the caliber of athletes involved and because skating isn't an NCAA intercollegiate sport." Richardson and other medical and skating experts will instruct students – 12 from Whitworth and two from Eastern Washington University – about the specific medical, biomechanical and psychological issues faced by elite figure skaters. The course will cover topics ranging range from conditioning and common injuries to the anatomy of a figure skater and a double-toe loop. 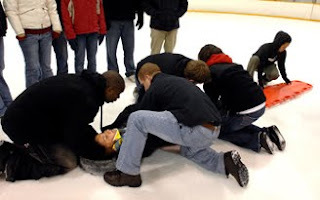 Instruction will take place in the classroom and on the ice, including a simulation of an emergency response to a serious skating injury. "Every sport has its own injury profile based on the activity of the sport," says Richardson, who has worked as an athletic trainer at international events such as Skate America, the World Cup of Wrestling, and the USA vs. Cuba Boxing Challenge. "Figure skating involves high speeds, rotary motions and an unyielding surface, which can lead to injuries that our students don't necessarily see in other sports and will need to understand for this competition." Medical teams, each of which will include a student, will be ice-side at both skating venues, and at a medical suite in the skaters' official hotel for up to 18 hours a day that skaters are training or performing. The students will assist in providing comprehensive medical care, including initial injury assessment, application of therapeutic modalities, appropriate first aid, and preventive activities such as stretching and massage. Established in 1987, Whitworth's athletic-training program enrolls 50 majors in a rigorous curriculum that includes 1,200 hours of clinical experience and prepares students for certification by the Board of Certification for Athletic Training. Several graduates have been selected for internships with professional sports teams; Whitworth athletic-training alums are sought after for teaching and athletic-training positions in high-school, college and university athletic departments. A number of Whitworth athletic-training graduates have earned advanced degrees to pursue other health-care professions including physician assistants, chiropractors and physical therapists. Located in Spokane, Wash., Whitworth is a private liberal arts university affiliated with the Presbyterian Church (USA). The university, which enrolls more than 2,700 students, offers 55 undergraduate and graduate degree programs. Russ Richardson, director of athletic training, Whitworth University, (509) 777-3244 or rrichardson@whitworth.edu.